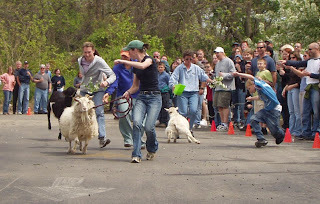 The Sly Fox Goat Race is the perfect beer & family activity. What is more American? Kids, beer, great food, music, friendly competition and farm animals. I've loved this event for years. The way I see it, if it continues to grow at its current pace it wont be long before TV cameras are covering the goats the same way they cover those high priced ponies in Kentucky. This is going to be my first time attending. I have heard nothing but good things about this event. Just like you said Lew, I am going with my wife with the intent to have fun. Obviously, I'll will opt to drink, but responsibly and respectfully. No need to take it beyond that. Also, with it being my first, there will be a lot to take in. Definitely taking notes and pictures. I've brought my family two years in a row. This year I have a conflict. I hope there's lots of coverage in the beer blogosphere so I can catch up on what we missed. Wish I could have attended for many reasons. I love that these events exist. It's an important part of what community is and should be that seems to be disappearing more and more each day. My wife and I, along with several of our friends would make the annual pilgrimage from the Lehigh Valley for this event. We have missed it two years in a row since moving to South Carolina. In 2010, we return!